Design user interfaces; web pages, blogs, sales pages landing pages, etc. easily with web-based WYSIWYG software. Whether it's a web page, blog layout or an iOS mockup we have objects to match your design. All the objects are grouped into sensible libraries so you can load only the relevant ones. This makes it very easy to find objects and provides you with a clutter-free drawing area. 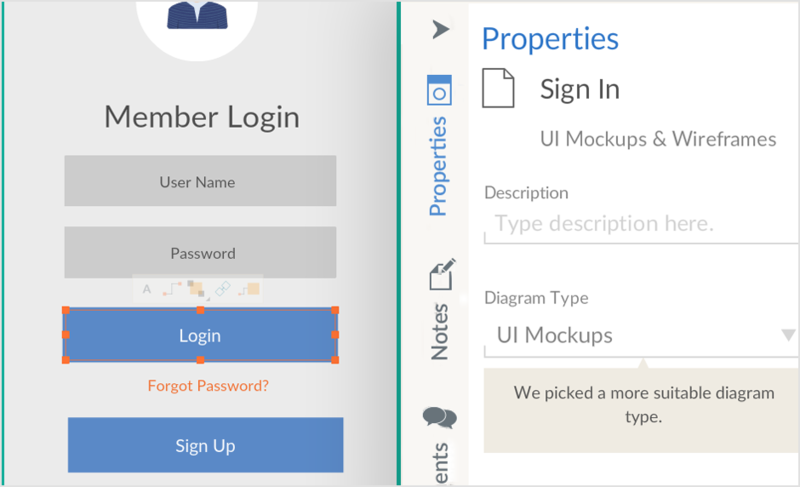 Specially designed objects like web sharing widgets, signup forms, login widgets make it extremely fast to come up with beautiful looking designs. Shown above are some templates available for you to get started immediately. We constantly update our templates with the latest objects so you'll always have templates with current objects. Plus there are 1000s more templates that are shared by our loyal users available in our diagramming community. You can access them directly from the app as well as with built-in search to find the exact template you're looking for. 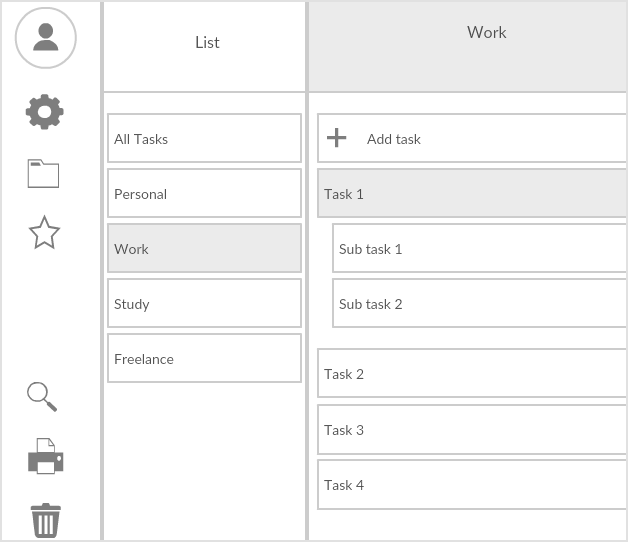 Our object linking feature helps you to create interactive wireframes. You can use the linking to link to an external site or to any other Creately diagram. 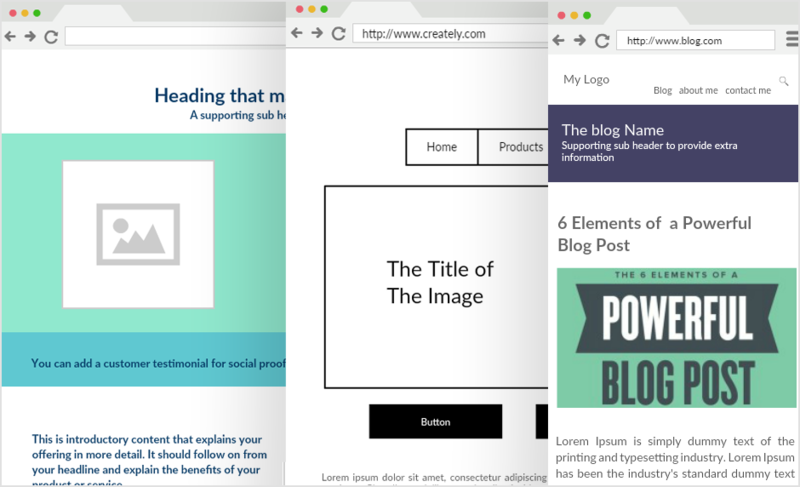 For an example, you can create the layout of the home page and link the blog text to another diagram that has the blog layout. So anyone who's viewing the wireframe or mockup online can click the blog link and see the layout of the blog. 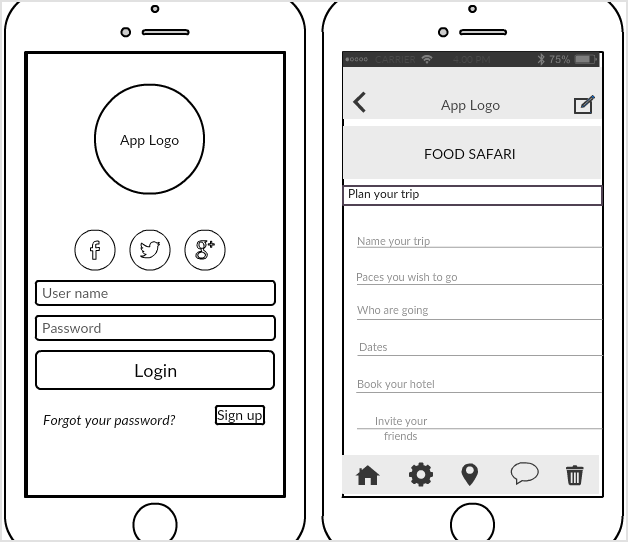 This way you can create interactive wireframes that are closer to the real world scenario. Our real-time collaboration features enable you to work on your wireframe online together with your clients or peers. See each other's changes in real-time and make decisions on the go. 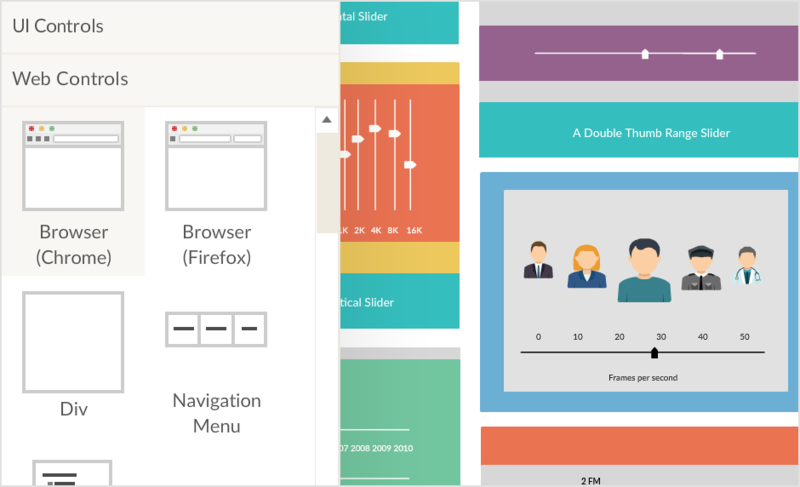 This will save countless hours spent on meetings discussing the design and the layout. All changes will be saved in the revision history so you will know exactly what was changed and who made it. This helps you to revert unwanted changes easily. You can export your wireframes as JPEG, PNG, SVG or PDF files. The SVG and PDF files preserve the links as well so you can export more data-rich documents. With the SVG export option, you can use Creately to create the wireframe and add design elements like colors and shading using a tool like Adobe Photoshop or Illustrator. SVGs are great for scalable large printouts as well as for presentations. 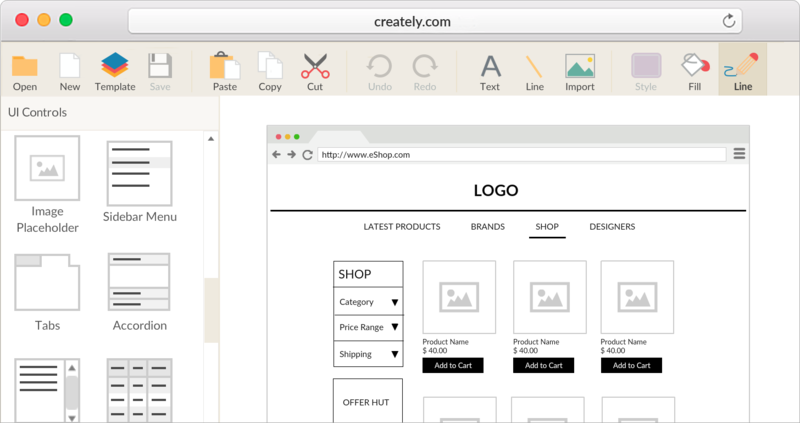 With so many options and features there is no reason not to give Creately a try. Creating an account is free and you get access to all the drawing features. 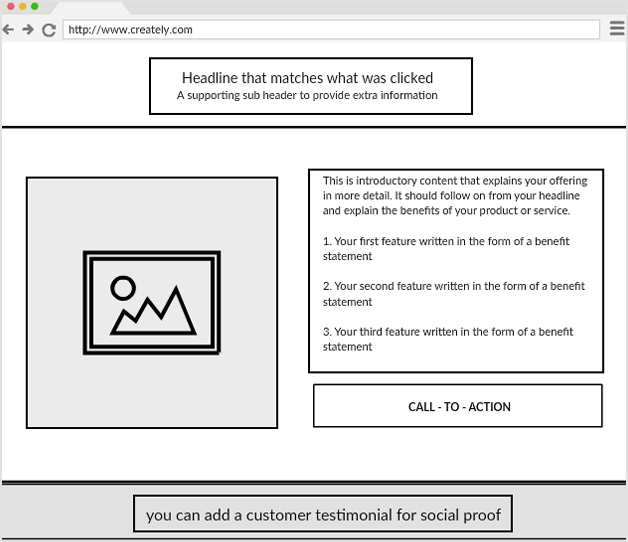 So start creating wireframes now with Creately ! !.